I did add a bow to my carving. 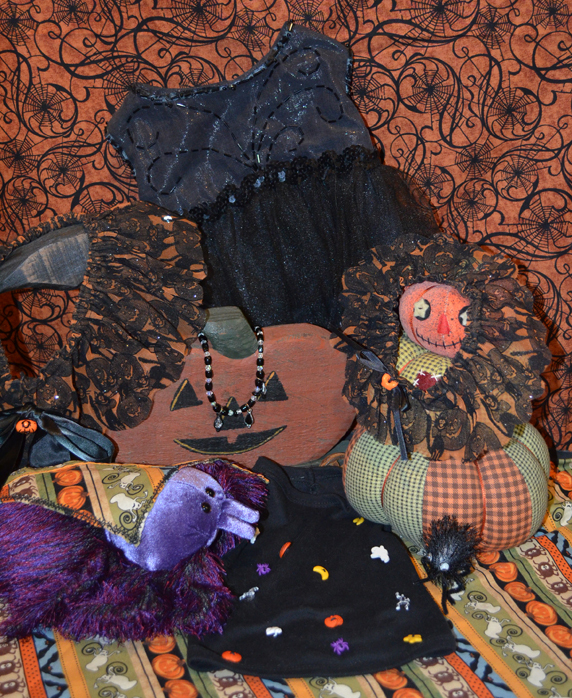 Today’s post is an overview of some Halloween projects. The Halloween pumpkin has a link to instructions. Most, are idea inspirations. 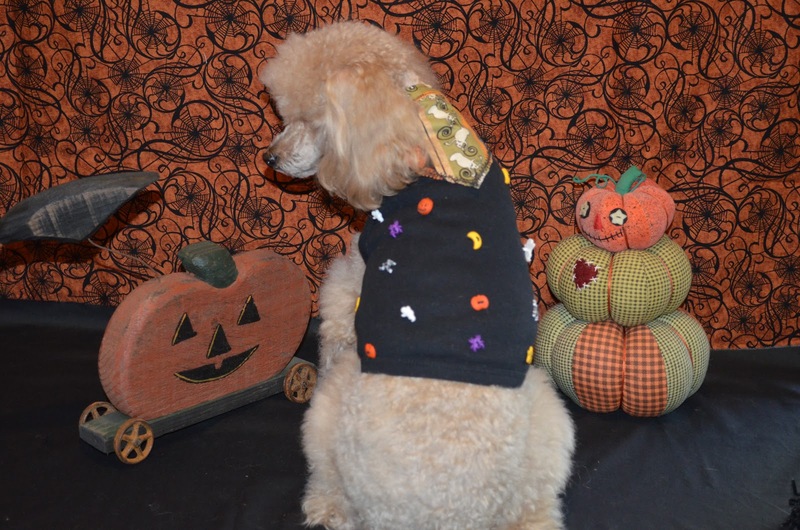 Start Halloween out with a Poodle Pumpkin. It’s easy with the patterns that can be found on the Better Homes and Garden Website. There are 24 different dogs to choose from and they are all cute! We usually have a family Halloween party and I like my dogs to look nice for it. But, I want them to look like themselves and not some bug, pirate or a bowl of spagetti. Sophia and Niko’s bigger brother and sister are going to help model these styles today. Most of my ideas are easy. Sophia’s dress would need some sewing experience. But black dresses are easy to find and decorations could be added to them for the occasion. 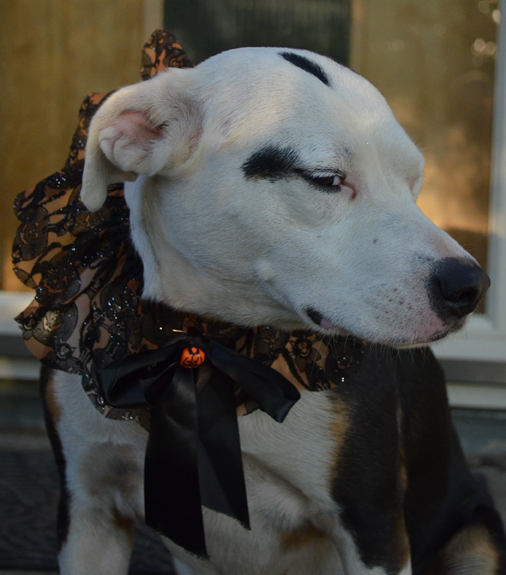 Sophia, In her Halloween costume-a basic black dress and a Halloween bow. 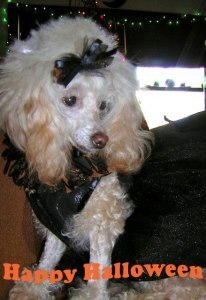 The neck ruffle, made of tulle, is a separate item that can be worn by itself. Some years she wears only a necklace with the dress. The necklace is in a photo below. I used beads from Wal-Mart. Big sis Penny is modeling a ruff for bigger dogs. from Hancock Fabric but every store has a great selection around this time of the year. The edge is just cut into a big scallop and not hemmed. Make the length about 50% longer than your dogs neck. Cut the elastic with about and inch ease and don’t forget to add for the overlap. Decorate with anything you want. I had remments of black ribbon and and old pumpkin button. to get a shirt for you kids from 4-86 pounds and there is a 14 color selection. This is an easy project. Iron on appliques would also be good for this project. But that is a subject for another day. 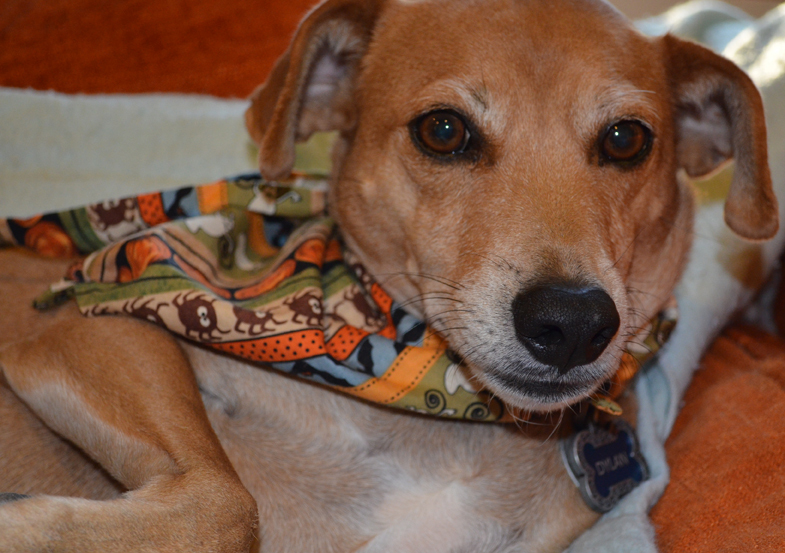 Our Mountain Fiest, Dylan is modeling my first attempt at a Halloween bandana. I just made a triangle that ties; but I don’t like bulkiness of the triangles and will only make banded scarfs with velcro from now on. I also learned a lesson about not making bandanas to long. Dylan decided to chew the tip off his. I had to improvise a new ending. Live and learn, as they say. A closer view of the Halloween bow. Bows are one of my favorite things to do. 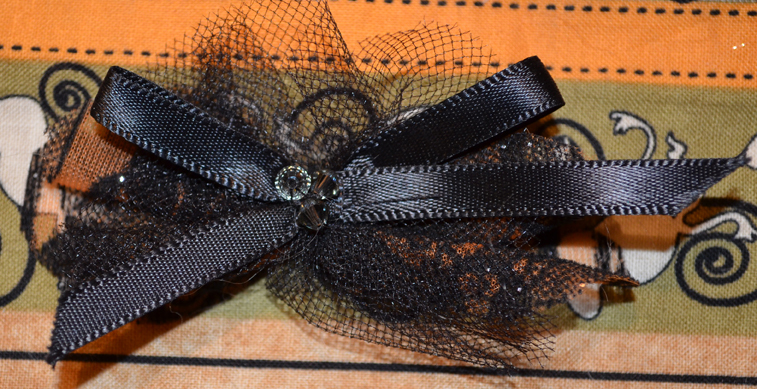 This one has four layers: tulle, netting, ribbon and Swarovski crystals. I start with the botton layer and work my way up. Everything is tacked together with thread. I sew a grooming band on the back. I think bands are more secure, but a little more difficult to get in Sophia’s hair. But they stay in. A clip would also work. 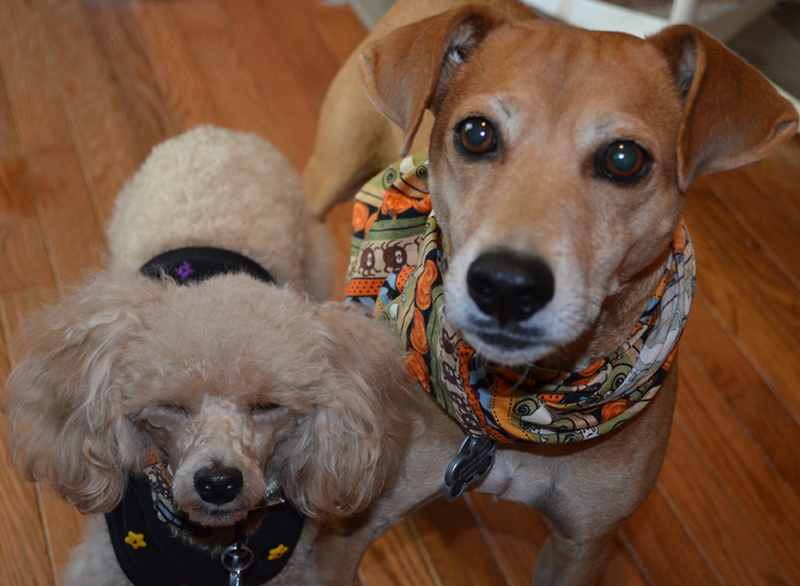 Your pack looks good in their Halloween costumes. 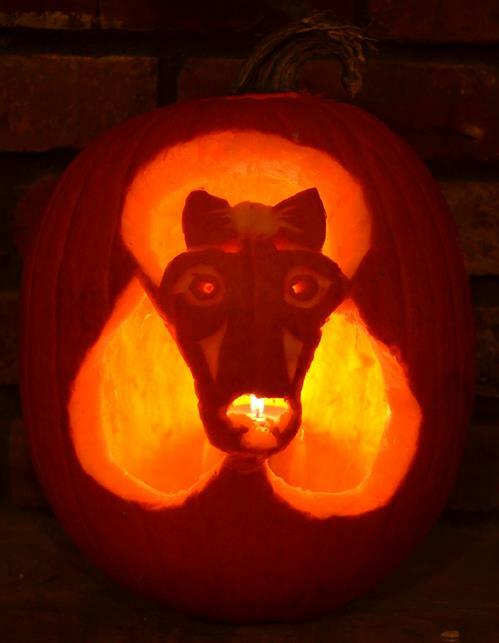 That jack o lantern is really cool. Thanks, I tried to get Bennet, our black lab to model-but he kept lying down on the job!!!!!!! !